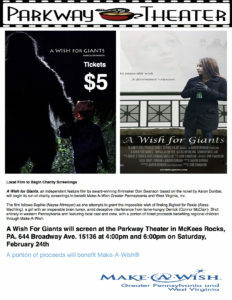 A Wish for Giants, an independent feature film by award-winning filmmaker Don Swanson based on the novel by Aaron Dunbar, will begin its run of charity screenings to benefit Make-A-Wish Greater Pennsylvania and West Virginia, Inc. The film follows Sophie (Naysa Altmeyer) as she attempts to grant the impossible wish of finding Bigfoot for Roxie (Alexa Mechling), a girl with an inoperable brain tumor, amid deceptive interference from fame-hungry Derrick (Connor McClain). Shot entirely in western Pennsylvania and featuring local cast and crew, with a portion of ticket proceeds benefiting regional children through Make-A-Wish.